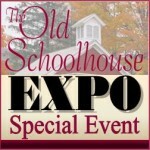 Last week I posted to tell you that the Old Schoolhouse Expo Special Event is coming! I can't wait! So don't forget. The Old Schoolhouse Expo Event is your own personal Home School Convention piped right into your own home! Through your computer you can listen to the guest speakers, every single one, any time you want to! So, two of the speakers are Adam Andrews and Andrew Pudewa. I already told you about Adam Andrews. I "fell in love" with him when I was reviewing Teaching the Classics for Institute for Excellence in Writing. I loved his presentation in Teaching the Classics, and I can't wait to here his talk(s). 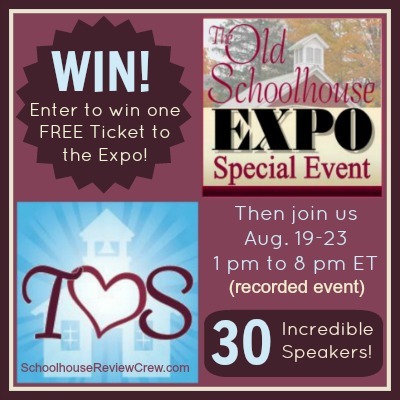 So, buy a ticket for $24 or win a ticket, but don't miss it! ************DISCLAIMER: I get to receive on ticket to attend this event for free in exchange for telling my blog readers about this event. I am disclosing this in accordance with FTC Regulation 16 CFR, part 255, "Guides Concerning the Use and Endorsements and Testimonials in Advertising."